Building A of the Palace of Nations. 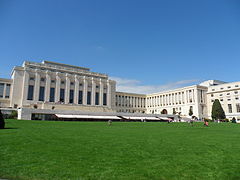 The Palace of Nations (French: Palais des Nations, pronounced [palɛ de nɑsjɔ̃]) is the home of the United Nations Office at Geneva, located in Geneva, Switzerland. It was built between 1929 and 1938 to serve as the headquarters of the League of Nations. 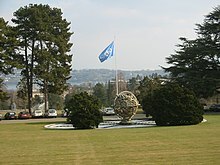 It has served as the home of the United Nations Office at Geneva since 1946 when the Secretary-General of the United Nations signed a Headquarters Agreement with the Swiss authorities, although Switzerland did not become a member of the United Nations until 2002. In 2012 alone, the Palace of Nations hosted more than 10,000 intergovernmental meetings. The Palace, whose construction is the object of the competition, is intended to house all the organs of the League of Nations in Geneva. It should be designed in such a way as to allow these organs to work, to preside and to hold discussions, independently and easily in the calm atmosphere which should prevail when dealing with problems of an international dimension. In December 1988, in order to hear Yasser Arafat, the United Nations General Assembly moved its 29th session from the United Nations Headquarters in New York to the Palace of Nations. Ariana Park with Lake Geneva in the background. The Palace is located in Ariana Park, which was bequeathed to the City of Geneva in 1890 by Gustave de Revilliod de la Rive, on several conditions: i.a., that the park always remain accessible to the public and that he be buried in the park. The park also contains a 1668 chalet. Beneath the Palace's foundation stone is a time capsule containing a document listing the names of the League of Nations member states, a copy of the Covenant of the League, and specimen coins of all the countries represented at the league's Tenth Assembly. A medal showing the Palace of Nations with the Jura Mountains in the background was struck in silvered bronze. The building overlooks Lake Geneva and has a clear view of the French Alps. Kuntz, Joëlle (2011). Geneva and the Call of Internationalism: A History. Geneva: Editions Zoé. ISBN 978-2-88182-855-3. ^ Pallas, Jean-Claude (2001). Histoire et architecture du Palais des Nations (in French). Geneva: United Nations. pp. 100 and 104. ISBN 92-1-200354-0. ^ Petite, Simon (23 December 2013). "Rénovation du Palais des Nations: vote crucial". Le Temps (in French). p. 5. ^ Pallas (2001), p. 105. ^ Pallas (2001), p. 314. ^ "Genève renoue avec sa tradition de ville de paix". Le Temps (in French). 16 January 2014. ^ McMenamin, M. (2011). "A medal depicting the Palace of Nations and the Jura Mountains". Numismatics International Bulletin. 46 (3–4): 55. Wikimedia Commons has media related to Palace of Nations.